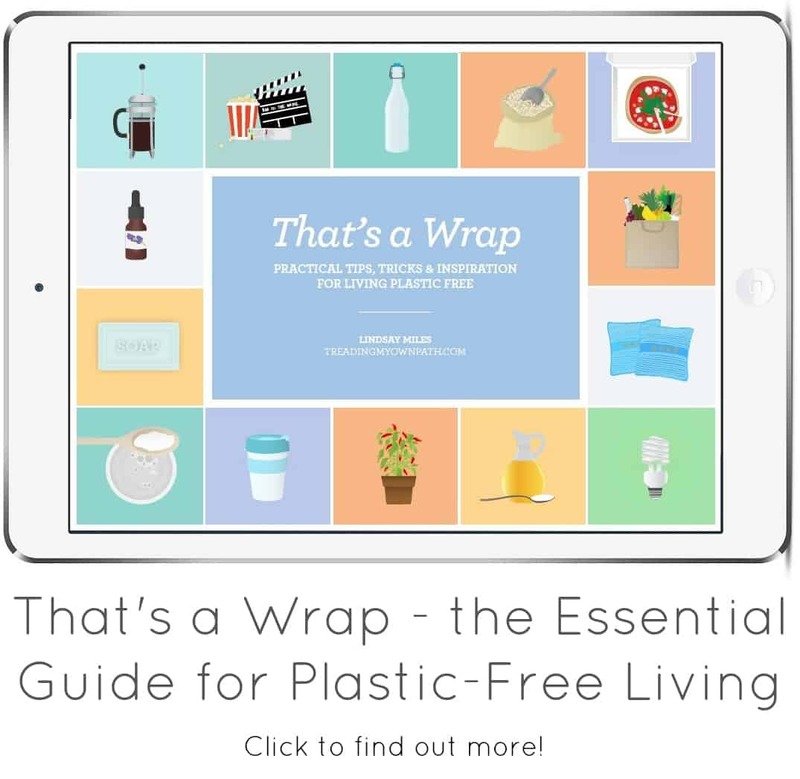 In my perfect world, I wouldn’t buy a single thing in plastic, I wouldn’t use a single thing in packaging…oh, and the sun would shine every day :) Even though I’ve lived plastic-free for almost 5 years, and describe myself as “zero waste”, there are still things that I buy in packaging. There are still single-use items I choose not to live without. Oh, and there’s still occasional plastic. Of course I aspire to do better. 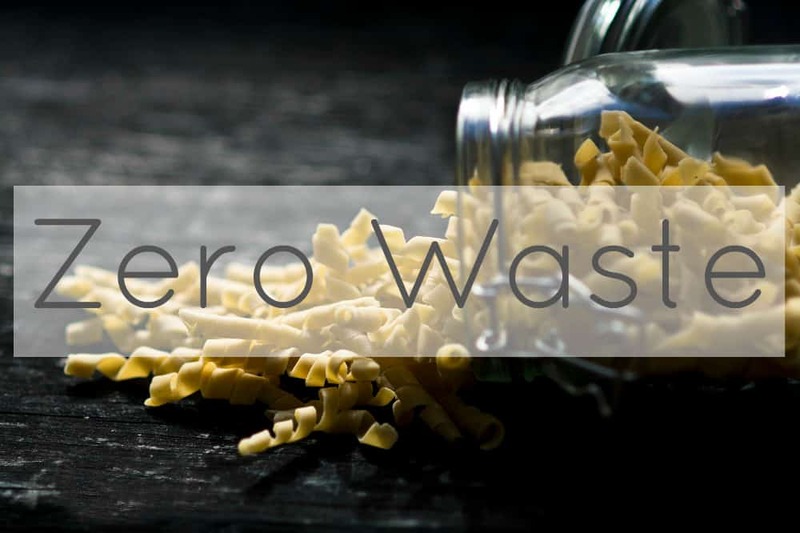 But I don’t believe that zero waste is about being perfect. I believe it is about making better choices, trying to improve and doing the best we can. If it was about being perfect, almost all of us would fall short. Then we’d decide it is all too hard, and give up. What a waste that would be! If we all make a few changes, that adds up to an enormous difference. Both my husband and I have our zero waste weaknesses. It’s all too easy for me to lump them together – and then blame him for most of them! So I’ve decided to focus on mine only. Just this once! I know that many people use “cloth” rather than toilet paper. I know that I could get a bidet attachment for my toilet. But the truth is, right now, I use toilet paper. It’s not that I am opposed to either idea, but my husband has assured me he is never giving the loo roll up, and I don’t want to have two systems. I’m happy to stick with his! That’s not to say I’ll never change, but right now toilet paper is working for me, and it’s staying. 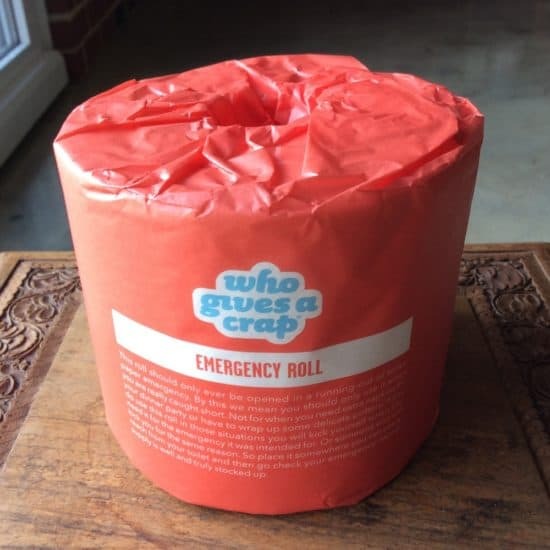 We buy Who Gives a Crap toilet paper. It is 100% recycled, the packaging is plastic-free, and the company donate 50% of profits to water projects overseas. We re-use the paper wrapping, and recycle the big cardboard box it comes in (the are 48 tolls in one box). It is an Australian company, although the rolls are made in China. Maybe not perfect, but it works for us. Chocolate is my weakness. I’m trying very hard to buy more bulk chocolate and less packaged chocolate, but I have a particular obsession with Green & Blacks 85%. I like to buy organic and fair trade chocolate, and bulk stores have less options. Yes, I know that Green & Blacks was purchased by Cadbury’s, and Cadbury’s was sold to Kraft. Not ideal at all. Truth is, I got addicted before that happened! 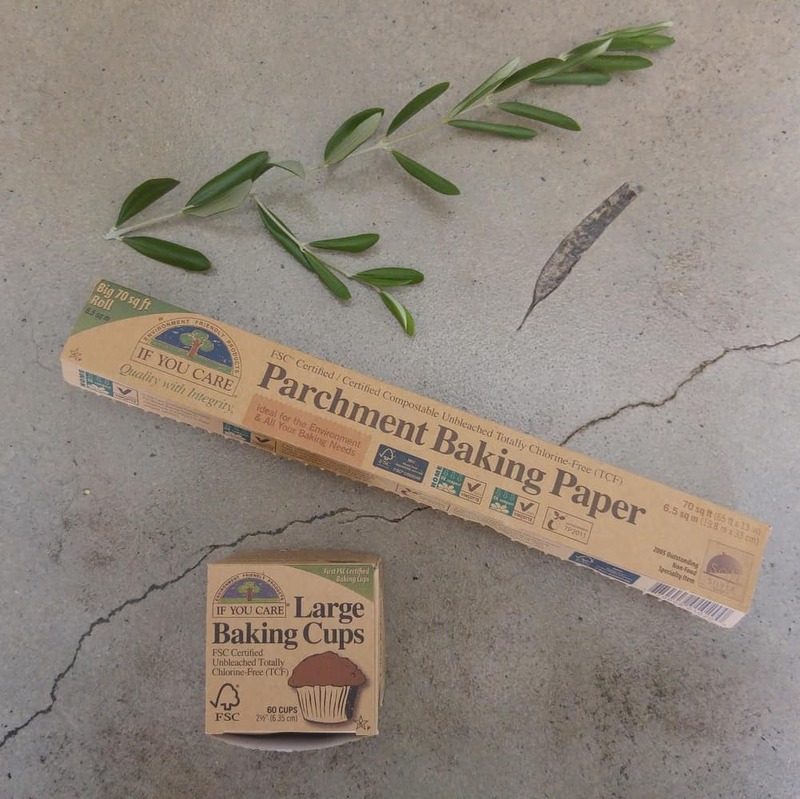 I use baking parchment. I use it to bake bread and biscuits (to line my metal baking tray) and to line cake tins or loaf tins. I find it helps stop the edges burning. Whilst I do have silicone muffin trays of various sizes, and silicone muffin cases, I sometimes need to bake more than I have, and other times I need a bigger size. Sometimes I use paper muffin cases. I’ve tried greasing my tins, but I prefer baking paper. Whilst silicone works well, it isn’t recyclable, and heating in the oven does seem to degrade it over time. The muffin cases (baking cups) I use very sparingly, but the paper I use more often. I will wipe the baking paper clean after use, and will aim to get a few uses out of it before composting. I’ve been buying seedling punnets to establish our garden. After almost all of my summer seeds failed to germinate, I resorted to buying seedling punnets (plastic punnets with seedlings in them ready for transplanting in the garden). It was that or not grow any vegetables all summer, so overall I felt I could justify the waste. I’ve tried reusing them, but the soil tends to dry out too quickly. I’ve saved them all up in the hope of passing them on to someone who will re-use them. I use the plastic labels in my garden. Hopefully I will be able to reuse these multiple times, but eventually they will end up as landfill. 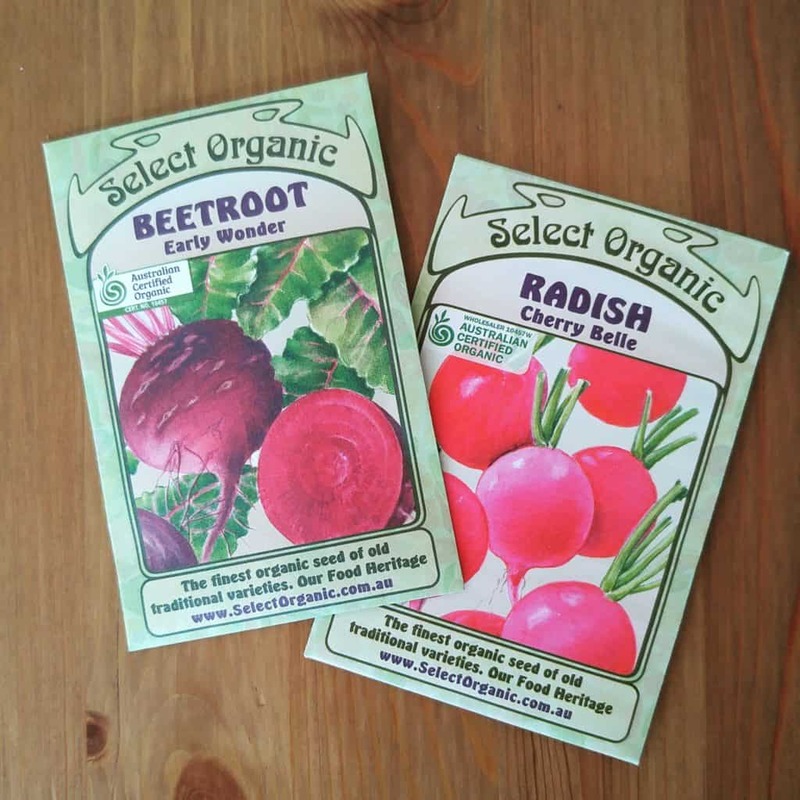 As we are establishing our garden, I’ve needed to buy seeds. Some seed packets contain foil/paper envelopes with the sees sealed inside; others have plastic zip-lock bags; and occasionally the seeds are loose. My long-term plan is to save most of my own seeds, participate in seed swaps and grow seedlings from seed. But seed-saving is an art, and it will take some practice. Some things (like tomatoes and capsicums) are easy to save from seed; other things are harder and some require expert knowledge (and more land than I have). So it’s unlikely I will ever be fully self-sufficient with my seeds. I will be able to reuse the zip lock bags and the envelopes, but the foil/paper packets aren’t recycable. 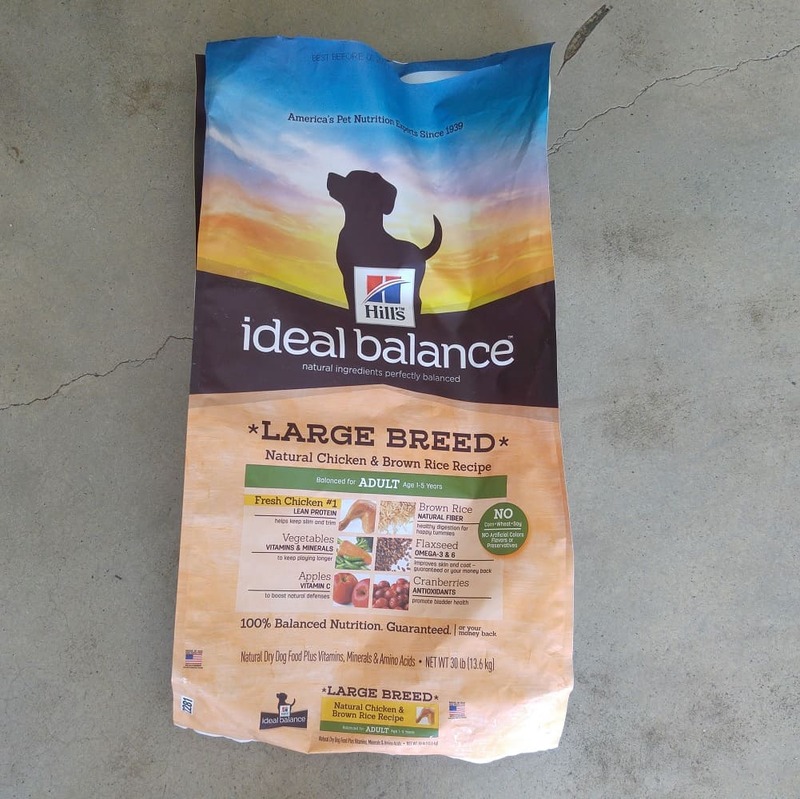 We buy our dog food in large 14kg plastic sacks. Believe me, I do not like buying packaged industrially-produced dog food. We have tried all sorts of brands, organic and locally produced and Australian-made, but our dog prefers this one. This is the biggest size available in this brand. Some Australian brands are slightly bigger (20kg). There is a bulk store in Perth that sells Australian dog food in bulk, but they buy 20kg bags and use those. As our dog eats through this in a month it doesn’t make sense for us. I’ve looked into making food myself, but we don’t have space to make it in advance and freeze, and I’m not sure I want to go to the butchers every few days. Maybe in the future it will happen, but for now, we are sticking with this. The plastic is recyclable at REDcycle. 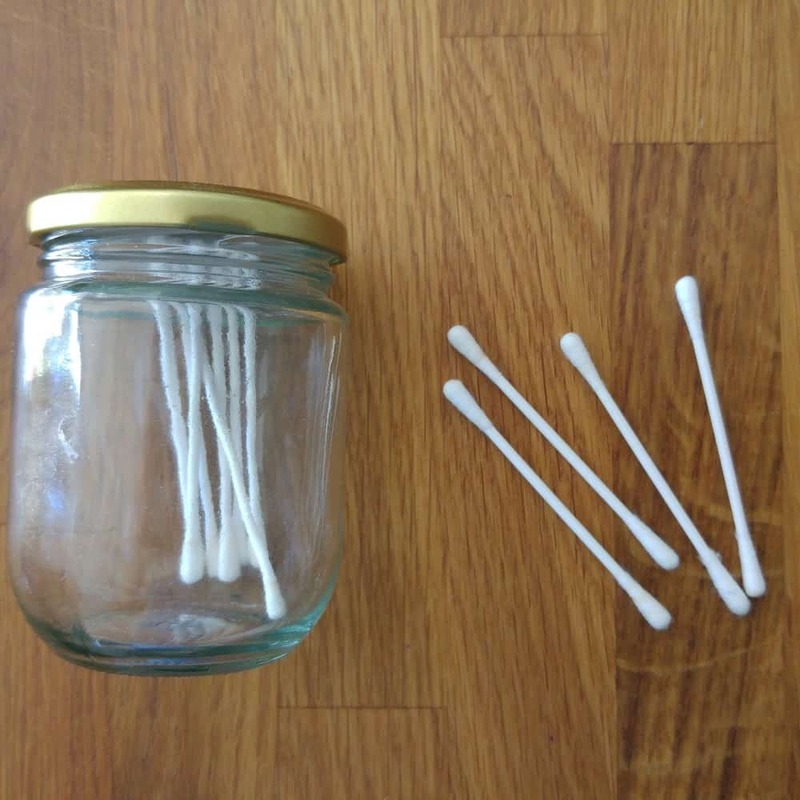 I know that Q tips/cotton buds are meant to be bad for our ears, but seriously, I cannot bear to have water in my ears, or blocked ears generally. I use Q tips. 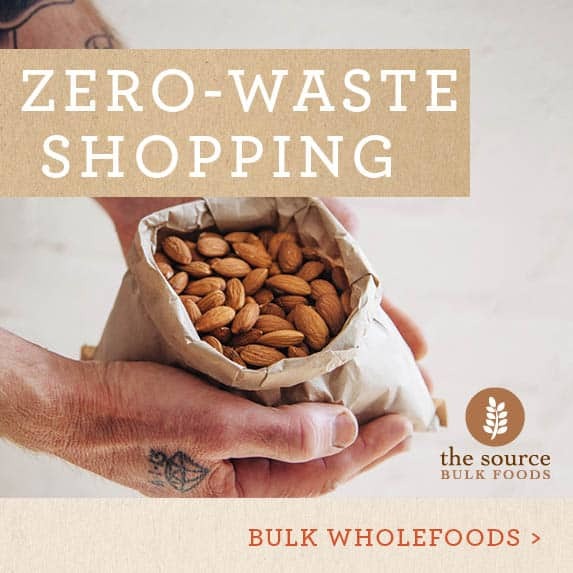 They are 100% compostable and they come in 100% compostble packaging, but they are still a single-use item, and one that many zero wasters do without. I, however, have no plans to give them up. I never ever use the ones with the plastic sticks. I also don’t use them often, maybe once every couple of weeks. These are made from paper/card and organic cotton, in a cardboard box. I’ve had this box for around 2 years, and I’m due for a new one soon. When I went plastic-free in 2012, I started using bamboo toothbrushes. The bristles would constantly come out in my mouth and it used to drive me nuts. Not only that, but as I watched the plastic bristles wash down the drain I’d think – isn’t that exactly what I’m trying to prevent? I saw a plastic toothbrush with a remove-able head in a health food shop in 2014 and made the switch. The heads only need replacing once every 6 months (I was replacing my bamboo toothbrush every two months). 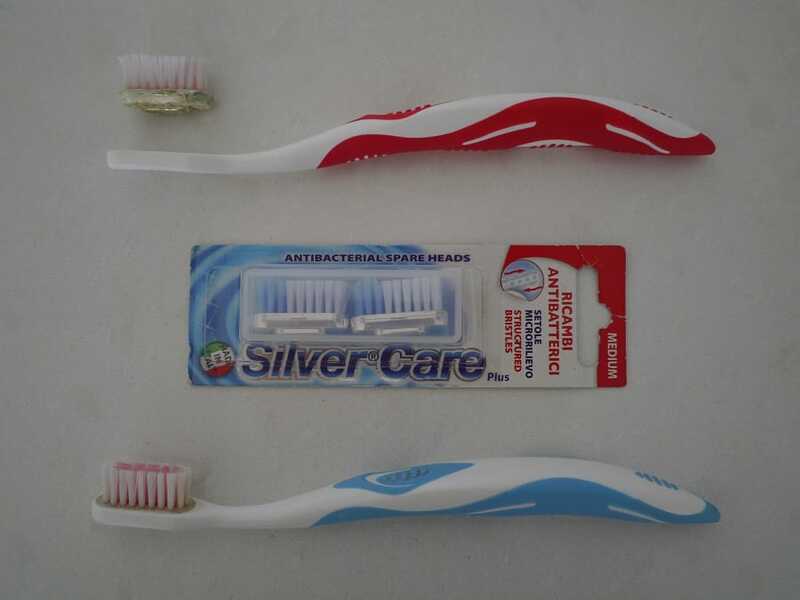 The toothbrush is a brand is called Silver Care. I don’t love the plastic handle, but I think as a toothbrush, it does the job. The packaging and head are recyclable via Terracycle. I suspect that it was the brand of bamboo toothbrush that was the issue, rather than bamboo toothbrushes as a whole, as many of my readers have told me that they get on well with different brands. Nevertheless, now I have this one I intend to re-use it. Otherwise it’s a waste. 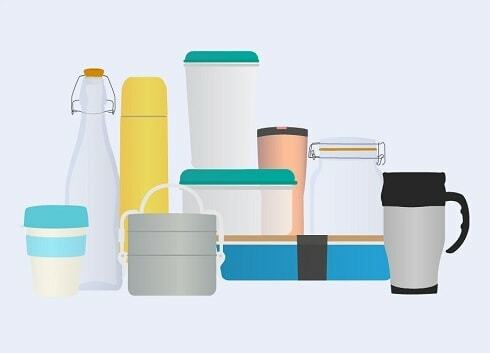 Mostly the zero waste and plastic-free movements align, but sometimes they do not. 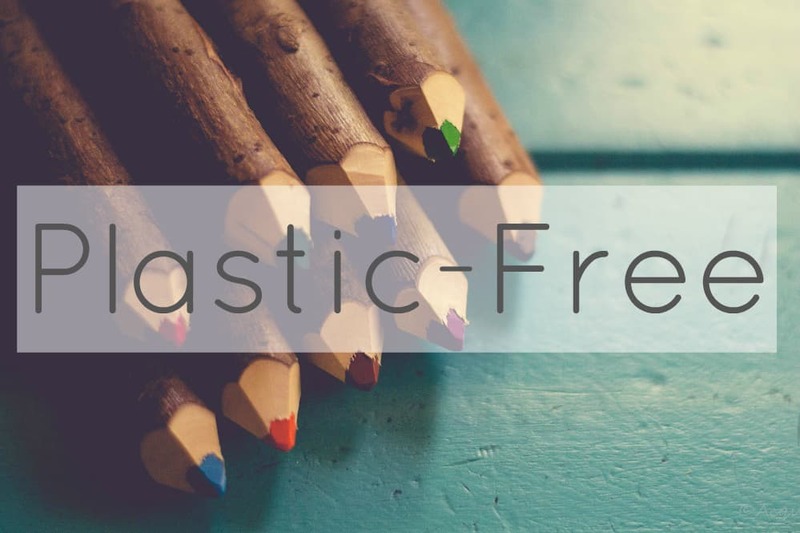 I’m happy to repurpose plastic if it is suitable for the job intended, will last, reduces landfill, and there isn’t an obvious better solution. 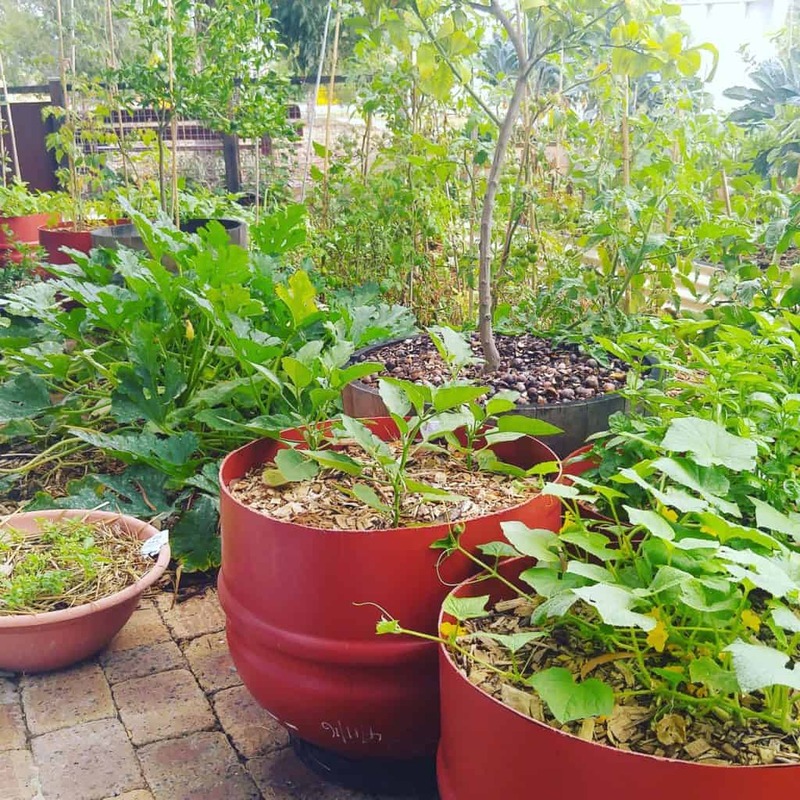 We used repurposed olive export barrels to make garden beds/pots for our veggie garden. These plastic barrels are used to ship olives from Greece to Australia just once, and then they are landfilled. We cut each one in half and turned them into garden beds. Each barrel cost around $30 (and cut in half makes two pots) compared to $150 for a single half wine barrel of the same size. They are food grade, UV stable and a waste product. I’d rather olives were shipped in reusable containers, and maybe one day that will happen. Until then, I’m happy using these to grow my own food. Where I’ve been offered something that I know I can use and that might otherwise end up in the bin, I accept it. Reducing waste in generally is my priority, not keeping my own home pristine. My sister-in-law recently gave me a box of strange-flavoured tea that I knew I would drink and she knew she wouldn’t. It came in a box with a plastic window. I’ve also been given some DIY skincare ingredients from a member of a community group who would have thrown them out had no-one wanted them. 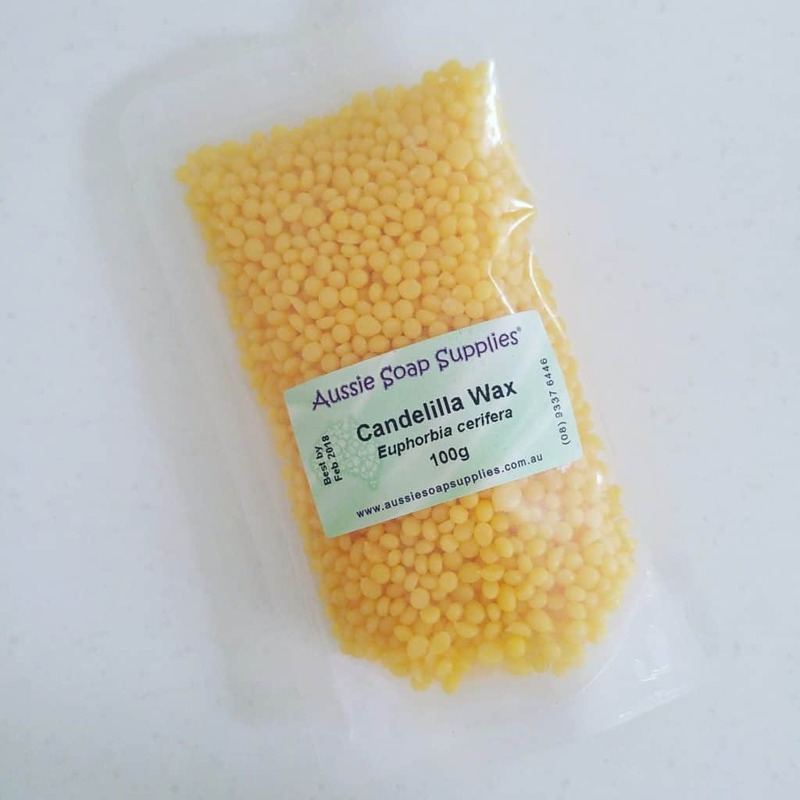 This wax is a plant-based (vegan) alternative to beeswax, and I’m keen to try it out in some recipes. I’ll recycle the packaging when it’s empty. I’m happy to take packaging from others and accept the waste if it means not wasting the product itself. Now I’d love to hear from you! 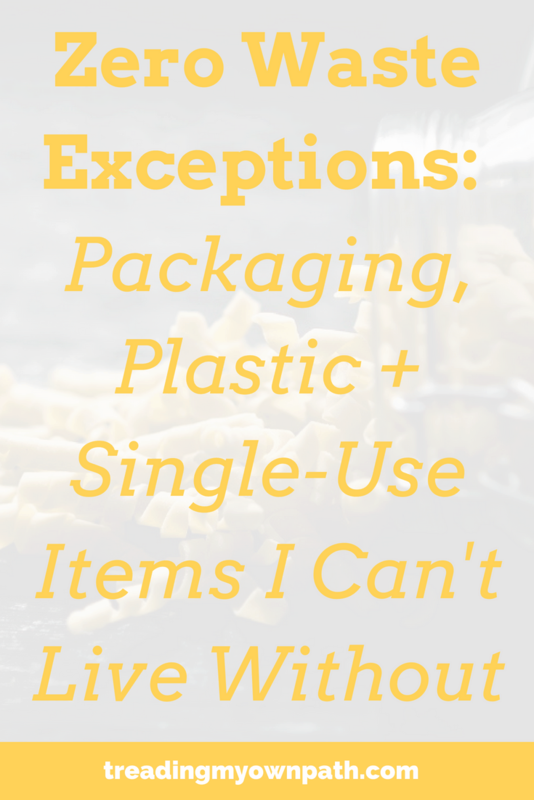 What are your zero waste exceptions? Are they things you can’t avoid, or things you choose not to? What is your biggest struggle? Is there anything that you thought would be impossible to give up or avoid, only to find that you were able to much more easily than you thought? Can anyone relate to me me on the chocolate issue?! Please leave your thoughts in the comments below! 64 Comments • Leave a comment! I use the bamboo and cotton ear cleaners that come in a compost friendly box, so don’t count them. My local garden centre and a few others in Syd encourage people to drop off plastic pots. They reuse them and some are reused by the community garden behind them. My kitchen plastics are down to yoghurt, tiny milk carton, and ice cream. My fighting fish food also comes in plastic packaging. I also have prescription meds. I am ok with all of that. Still have more plastic in the bathroom than I would like, but that is decreasing, slow and steady. Hi Mel! Yes, the cotton ear bud/Q tips I use are completely compostable too, and I compost them, but I know other zero wasters think they are a sin ;) Probably because they are single-use. So I counted them on the list. I think our local soil company has a seed pot return scheme, but I’m not sure they would like these trays. Next time I’m there I will check. I know that the big chains don’t – although I avoid these. Slow and steady wins the race Mel! ;) You will get there. Yah, I have accepted the fact that I rarely cook beyond couscous or loose leaf tea. So, I accept my yoghurt plastic. Just passed my 1 yr shampoo free anniversary. Plastics left in the bathroom include toothpaste (I actually really like my bamboo toothbrush), suncream, bandaids, iodine, ibuprofin, the cap on my bushman’s spray, and my contacts and contact cleaner. I use gas permeable contacts which create relatively minimal waste compared to other types of contacts. I like to do outdoor activities and I find some fairly creative ways to injure myself. I do bushcare a couple times a month and always remove other people’s litter when I am out paddling, walking…. I’m ok with most of what I have left. I do reduce what I use, but still have stuff for when I really do need it. Ah, fair enough re the yoghurt Mel! We can only do what we can do! I love that you describe using loose leaf tea as “cooking” ! ;) I think that definitely means you won’t be making yoghurt any time soon! Yep. Loose leaf tea or couscous. I generally don’t go beyond combining hot water from a jug with 1 ingredient. This is great, I love how you keep everything realistic and achievable. BUT what do you do about butchers/pet meat packaging? I don’t eat meat and my husband only rarely does. I guess you can ask for certain things to be wrapped in paper which can be composted, but pet meat is super bloody and always comes in plastic. What would you suggest? Hi Gemma, thanks so much for your comment and apologies for not replying sooner but it was hidden in my spam folder! I have no idea why! I get my dog food from Homestyle Pet Foods (for those people living in Perth). It gets delivered to the door and they re-use the containers. It’s wet food and my dog loves it. I get the 4kg container which costs $14 so the price is good. His name is Mike and telephone number is 0419 969 846. He did have a website but it doesn’t seem to be working at the moment. I supplement with a bit of dry food from Wasteless Pantry. The amount our skinny greyhound eats is ridiculous! I’m not sure how long 4 kg would last but I’m thinking about 15 minutes… ;) I will check his site when the website is back up. Thanks for the suggestion. I think somebody (maybe you) recommended this to me when we first adopted our greyhound, and I did look into it at the time but I think I had the idea that I would cook it all myself. Well that hasn’t happened! Wow, I hope in 5 years I will be as efficient as you! I steel buy orange juice in card box for my boys…not the lunch size, the family size, but still. My boys don’t like the one I do in the juicer. Same for milk, I am vegetarian, but they don’t and they like dairy. I haven’t found a close place where I can buy milk in glass consigned bottles. I would have to do 20km to get some, which is not good for my carbon impact. I choose my battles… I still have to much recycling, I have to work on it. I buy the biggest size I found like I learn reading you, so I don’t make to much waste. I like reading your post, it inspire me and I adopted many habits that you suggest. So thank you again! I think it is all about choosing your battles, as you say. There is rarely a perfect choice. In the future I hope that there will be more and better choices, and I think it will happen sooner than we think. Change is coming! My EcoBamboo toothbrush definitely sheds bristles. I’ll try another brand next time, but may have to go back to plastic. It does feel nasty when a clump of bristles explodes in one’s mouth. Like a mouthful of plastic spiders. As always, thank you for sharing your experiences and helping us newbies stay motivated. Yes, you are right about the toothbrushes. Plastic spiders, that is exactly it! It is gross! I used to buy The Environmental Toothbrush. I’ve heard other brands are better. Nail buffers?! That is so hilarious! I agree that nails do look nice and shiny when buffed but I just don’t have the patience or motivation to bother. I’m happy with ridges! My nails tend to be full of soil anyway, so shiny-ness isn’t going to help much anyhow :/ If you ever come up with a lower waste alternative, let me know! Ah you have a wooden one? That sounds better than metal! Have you come across Pearlbar tooth brushes. Australian and completely biodegradable. Might be worth a go before switching back to plastic?! My current understanding is that no bamboo toothbrush has bristles that are 100% biodegradable. So I’d be interested to find out what “eco-enhanced nylon” is and how it is tested to measure compostability and biodegradability. I wonder if it’s a greenwash claim. I’ll write and find out! I don’t think it’s green-washing. They seem to be a genuine green company, but then they can also be mislead…like all the stuff with with Environmental Toothbrush company, were they thought (and initially stated they used nylon 4) but Chinese manufacturer supposedly switch to nylon 6. As far as I know Pearlbar is nylon 6 but with some weird microbe action going on. Worse case is there are plastic bristles, still better than all plastic, but would hate to think they are actually lying! Let me know what you find out! Yes, definitely. Can’t wait to hear what they get back to you with! It’s good to know that even 5 years in, you’re making reasonable exceptions!! I have to keep reminding myself that there’s no such thing as a zero waste “fail” but just that life happens in an economy that’s not circular. This actually prompted me to see if they had stock of Who Gives a Crap in the US yet (they hadn’t when I checked earlier this month) and now they do!! I’m excited to try it– when they were sold out, we went to an office supply store and bought a box of paper wrapped TP… definitely not the comfiest TP I’ve used since it’s intended for offices, but it got the job done ;) As always, thankful for your posts! Thanks Jackie! Yes, it’s more a “zero waste frustration” than a fail! And yes, if there was a circular economy it would be easier. 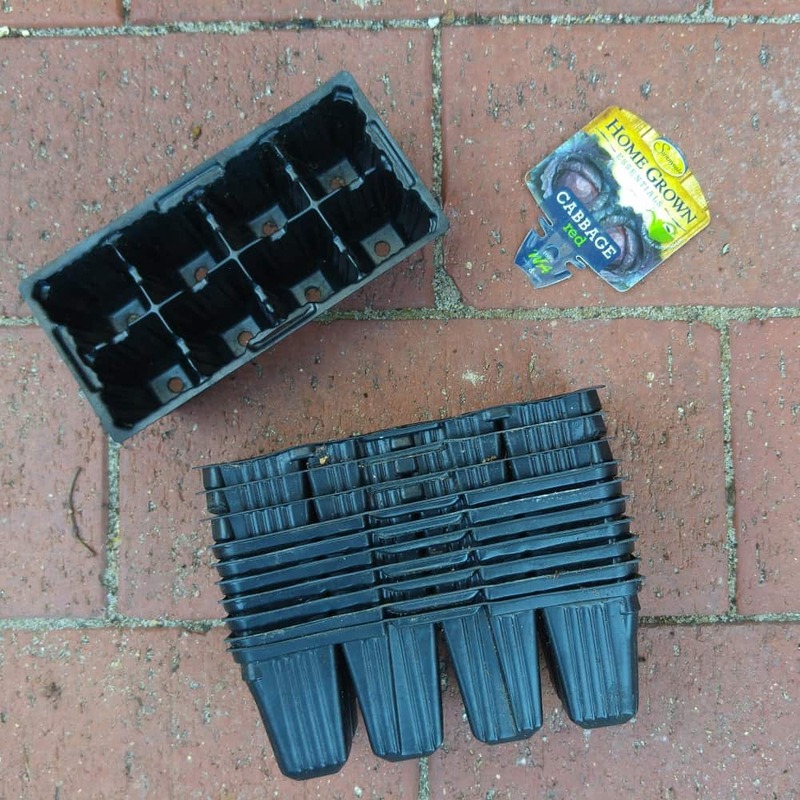 For example the seedling trays I buy in plastic, I know that garden centres in other countries sometimes sell them in compostable pots (I’ve seen some made from recycled cow manure – how awesome and zero waste! ), so avoiding plastic. But they haven’t reached here yet. may i suggest returning the punnets to the (or a) nursery? also, i’ve seen other zero wasters use ear cleaning spoons. this is on my wishlist when i finish my q-tips. I will investigate if the nursery collect them back. The place I bought my most recent ones don’t except for “recycling” which I suspect actually means landfill. I will check out the smaller independent ones. thank you for the yogurt suggestion. i have heard of it, but i’m not much of a kitchen person so i didn’t explore it too much. ;) i shall look into your post. It is dead easy – I have never had a batch go wrong! :) Let me know how you get on! Things we still buy on packaging include tinned tomatos. I know the tins are BPA lined most likely, but they are so convenient and I would be using like 25 real tomatos a week if I were using fresh some weeks! I wanted to buy a palette of tomatos from the wholesale grocer down the road and can a heap, but that would mean buying brand new canning jars. We also still get chocolate (green and blacks) I actually don’t mind the chocolate bits we can get in bulk but they are Lindt, toilet paper and milk we also still buy. We are working on the milk, but like you plan on sticking with regular toilet paper (from wgac) too! Hi Sarah! There are some brands that have BPA-free tomatoes, I remember the label was white and it was organic, but other than that I don’t remember. We use fresh tomatoes in place of tins – there is about 5 plum tomatoes in one tin. We just blend in the food processor and chuck in the pan! I did try making passata once, but unless you’ve got boxes and boxes of fresh tomatoes I think it is too much effort. Our bulk store sells Lindt in bulk, but also raw vegan organic stuff that is delicious but expensive and too addictive! I’d rather buy packaged Green & Blacks (fairtrade, organic) than bulk Lindt. The raw vegan stuff is nice, but it’s not actually dark. They have salted caramel and milk, and they are a little sweet for me. Good job on the canning! Why would they even charge you anything for the barrels if those are otherwise wasted anyway? 1. Stuff that I have to buy on-line, especially if it come from abroad. No matter how hard you emphasize the importance of no-plastic packaging, there’s almost always at least some. 2. Kids! Meaning their sneakers and school bags and school supplies and some toys and laminated book covers… And while I’m happy with my bamboo toothbrushes, my 2 y.o. is chewing on it rather than brushing his teeth. Of course it looses bristles who wouldn’t? 3. Toilet paper only comes wrapped in plastics. And I go for the biggest sets that are only 8 pieces. 4. Grandmas and Grandpas – they just don’t speak zero-waste language. They keep bringing in stuff not only packaged in plastics, but in STUPID plastics, like bananas in a bag or a piece of clothes for the baby in a bag that was obviously a later addition, it didn’t come in it, it was probably put in there by a shop assistant. 5. I’m renovating my house and THAT involves tons of waste starting with paint cans and paint rolls, ending with left over pieces that are too small for anyone to pick them up for their project. Hi Gayla, fair point about the barrels, but it is not the exporters themselves who sell them. There are people who must drive all around the place collecting them up and then selling them on. I guess most exporters aren’t interested in selling them or dealing with the public. So if they are making a business out of it, fair enough I say! Thanks for sharing your list! Yeah, I hear you re online shopping. I rarely buy things online because Australia is not set up for it. It is expensive and slow. We don’t have Amazon here yet, which is a good thing in my opinion. So people are more likely to go to local shops. When I lived in the UK everyone was obsesses with online shopping, myself included. But now I go back and I see all the couriers on the roads, and congestion and I think – this is because of all the online shopping. But as you say, sometimes things need to be purchased online. And if they are well-made, built to last and will save heaps of waste down the track, a little bit of bubble-wrap is worth it. Plus you can pass on packaging to other online sellers to re-use (that’s what I do). The SilverCare toothbrush I have also does kid’s versions, maybe that’s an option for you? The company is based in Italy I think so I am sure you’d be able to find them. Grandparents not speaking the zero waste language – oh I love that expression. I feel like it is quite a straightforward concept but sometimes people really seem to struggle to understand. Renovating a house is better than bulldozing it to build a brand new one ;) And it is good that you’ve been able to use the things up, at least! Yogurt & cheese. Giving up dairy milk I’m conscious of getting enough calcium. (I know it comes from other sources but I am always thinking about whether my quantity is enough) Plus my cheese is your chocolate ;-) I try to buy local vegetarian cheese and sometimes find ones wrapped in wax, which I clean and keep. But yogurt is next to impossible to buy out of plastic. I agree with one of your readers – so hard to get grandparents to stop buying & bringing things in to our house. No matter what we say the message of low/zero/ we don’t need or want anything/ does not register. 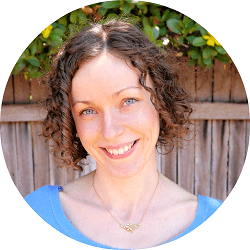 You feel like a crazy person repeating yourself and sometimes have to pick your battles. Honestly though, if everyone put in as much effort as you the world would be a much better place!! Yes, we tried Ivory Coat for quite a while. I would prefer to buy our food from them but our greyhound seems to prefer the Hills biscuits (he toilets a lot less, amongst other things). We were using the Turkey and Duck option. Greyhounds are meant to avoid lamb, and the kangaroo one is mixed with lamb, otherwise we would have chosen that. I’ll keep my eye on them in case they change their recipes any time though. Coffee – an essential! We actually get our beans from a local coffee shop that also roast and grind their own beans. Have you ever looked into whether there are roasters or cafes that sell beans near you? Or nearer, at least! My absolutely, cant live without are boxes of tissues around the house. I have tried handkerchiefs but gave up on them as I need so many. Yes I have taken medical advice on the sneezing and blowing problems. I’ on the lookout for recycled tissues. I cut up soft old t shirts in the size of a tissue and scrunch them into a glass vase and they are fantastic! I then throw them in the wash and reuse them. Winner! Hi Judith! Did you know Who Gives A Crap also do tissues? I’m not sure if they ship to New Zealand, but you aren’t so very far away… ;) Maybe worth a look! I’ve given myself ‘passes’ on: medications (always in blister packs more often than not), band aids, floss. Then like you, I’m on the same cotton buds. My TP is plastic wrapped, but I use that as a bin liner – I could get Who Gives A Crap, but parcels can be bothersome, it’s a lot to store, nothing really serious, but just, no, not yet. I still buy bulk frozen berries and they are always in a plastic zip lock which I reuse. Ah medication, yes Sarah! We tend to get some kind of flu once a year where we consume heaps of ibuprofen, but the rest of the year we don’t use anything really. My husband just had to get ear drops for an ear infection but the bottle was glass (dropper was not). Medical emergencies exempt! You could consider going half with a friend so you don’t have all the rolls?! We do a community order to save transport, and last time we had 20 boxes delivered. Honestly it was ridiculous. I’m going to stick with 10 next time! It was a logistics nightmare! Fortunately our neighbours (whom we share our garage with) were away on holiday at the time so we walled their car in – don’t know what we’d have done if they had been home! Can you please let me know where you buy the cotton buds that are 100% compostable? Just a note on the yogurt, I do try to make my own, but that means I have to buy milk, and homogenized and organic milk only comes in plastic. Other milks are too thin I find. And because I don’t drink cows milk, the rest has to be frozen and I have limited freezer space (aiming for zero waste, my freezer is always overflowing). And as I am trying to move away from dairy all together, soy and coconut yogurts are not easy to make at home and require purchase of a product that is not easy to get, and coagulants. Hi Sarah, thanks for sharing! 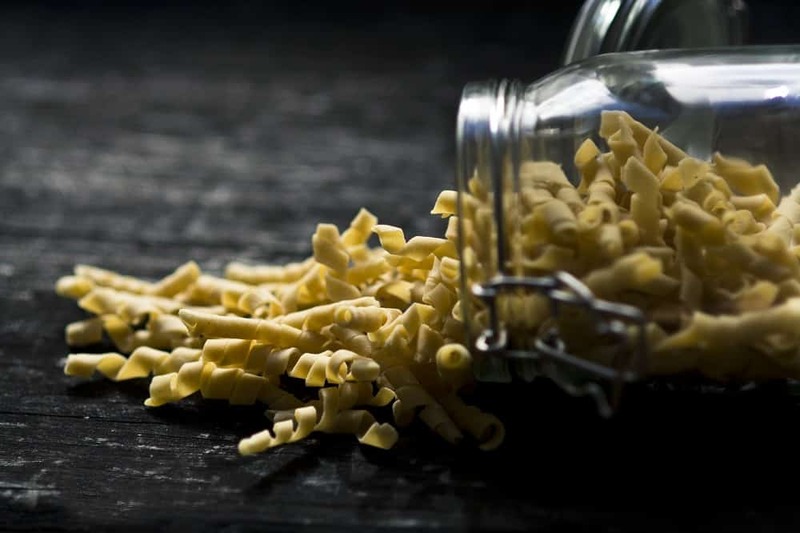 Plastic-free solutions are not always easy, agreed! As an aside, one way to thicken dairy yoghurt is to strain with muslin or cheesecloth, which drains out the whey but also reduces the overall volume. It will also thicken naturally over time. I have had success making coconut yoghurt using coconut milk and tapioca flour to thicken, but the issue for me was that it needed using up with 5 days, compared to a month for regular yoghurt. In the end I gave up yoghurt! We can only do what we can do! Hi Karen, thanks so much for the lovely comment and glad you enjoy my newsletter :) I think teenage daughters would be a tough battle. I remember what I was like as a teenager! Maybe helping her find brands that are organic, or packaged in glass, or at the very least microbead-free might be a good start. She might not be up for DIY solutions and vinegar rinses yet! But also know it is a long game, and slowly but surely you will notice your influence creeping in! Good luck! Hi Lindsay. I hope you won’t take offence at my comment but isn’t “we don’t have space to make it in advance and freeze” in relation to making your dog’s food at home a bit of a cop out? It surely wouldn’t be difficult to find a second hand freezer? I make my dog’s food from scratch in 2 large soup pots – mostly vegetables and a few piece of fruit. Once cooled, I add diced roo meat and mix in. He also has dried dog food from Vegan Pet in Victoria (15kg bags) https://veganpet.com.au/articles/?page_id=22 Alternatively, you could just add a stack of chopped vegies and fruit into a large crock pot if you don’t have much counter space. Hi Dylan, thanks so much for your comment and I take no offence at all! ;) The “no space to freeze” isn’t a cop-out, at least not in my mind. When we moved in here we looked for the most energy-efficient fridge-freezer we could find. We rarely buy stuff new so this was a big deal. We didn’t have a dog at the time. When we got him I did look at second freezers but the energy use would be massive, and it seemed kind of silly to go to the trouble of choosing an energy-efficient model and then buy a second one! The other practical thing is that our house is extremely light on power sockets. Short of having it stand in the middle of the living room it would have to go in the garage, which is accessed out of the front door and through the garage door which has one of those battery clickers. So it wouldn’t be super convenient either. And for the sake of a few frozen meals, not worth the expense, effort and energy. That said, I’m still keen to get into making my own dog food. I have a friend who makes this every few days, so they don’t freeze it, and I’d be happy to do that. So the freezing option is out, but we’d have space in the fridge. 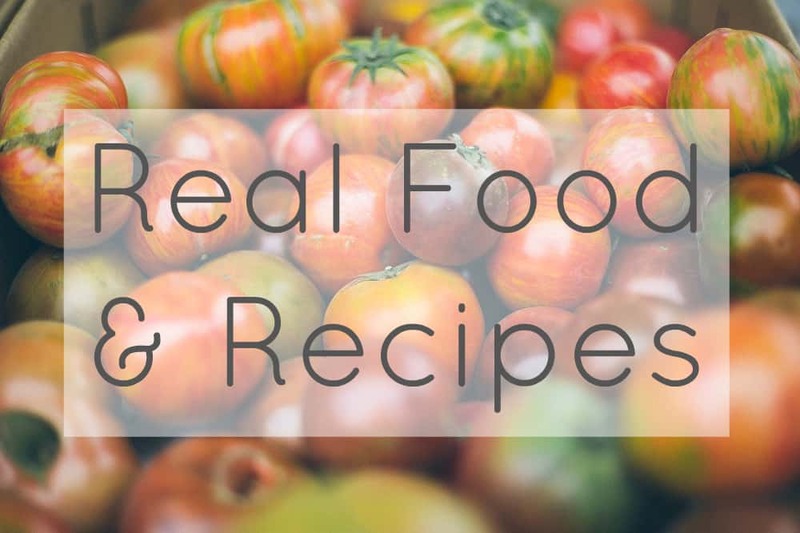 I have a folder full of recipe links and nutritional information and all of that, but in the end I got stressed out about it all. Having never had a dog before it was a big liestyle adjustment for me personally. But the food situation is something I am definitely going to revisit. I’ve struggled to find raw unpackaged kangaroo meat, which would be my choice. The butcher near us told me he could only buy it in (frozen!) 20kg boxes and I’d have to buy the lot. Going into butchers isn’t my favourite thing either and the few I’ve been to haven’t been suitable. So no, the freezer thing isn’t a cop out, but the truth is I have been putting it on the backburner for a little too long! Thanks for the prompt. I’ll get back in the research wagon this weekend, I promise! On another note, the zero waste webshop we have here in Hungary has a wooden toothbrush, and the bristles are made from pig hair. It was traditional to make brushes from pig and horse hair here in Hungary and in Europe in general, so no wonder it’s an obvious solution now as well. The girl running the shop made a deal with a German producer for selling dishwasher brushes as well, and that is made from horse hair and organic plant fiber for the harder one. Maybe there is something similar in Australia? Hi Dori – yes I did hear that he was Hungarian, and moved to the States and was shocked with all the waste compared to his home. Hence Terracycle! I’ve heard about pig hair bristles, but I don’t think they are available here. I’ve only hear of them, never seen them. We have dish brushes that have natural biodegradable bristles, some kind of plant material. But they’d be too big and course for toothbrushes. I don’t think I can give up toilet paper as well. Though I believe there’s nothing to be guilty of. 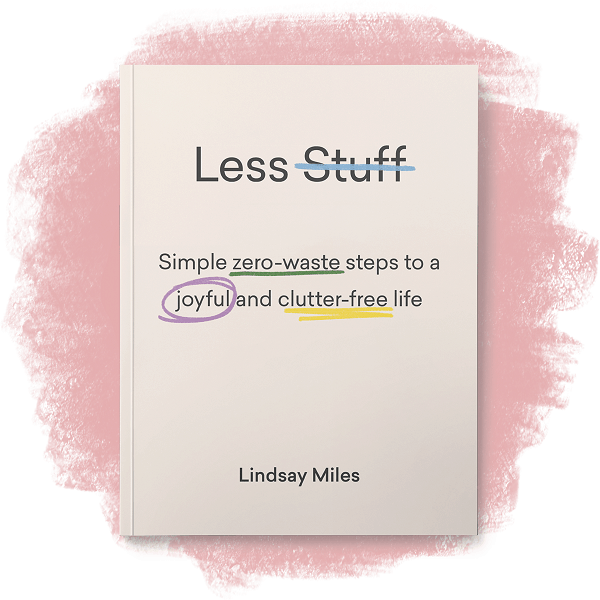 The fact that you’re doing your own share of reducing waste is already a big deal. For wastes that we can’t avoid, we can always send them to waste disposal companies that has recycling facilities to make sure they don’t end up in the landfill. Hi Zoe! I’d heard about them from a few people, but I got these from Gumtree – the guy’s business is called WA barrels. He sources them and sells them on. I’ve seen other people sell on Gumtree too. Bowling greens and places like that get blue ones but these are chemical barrels. Some are okay – like the ones that contain fertiliser – but I wouldn’t trust the others. With the blue ones, if they don’t have a label don’t buy them. My pleasure Ailish! None of us are perfect, we all just try to do the best we can. If we’re working towards trying to do things a little better in future that’s all we can do. Don’t stress too much about other members of your household not accepting all your choices – we are only in control of what we can do. It can be frustrating, but better to focus on the things that we have control over, I think :) Good luck! Great article as always! Thank you for your honesty :). I would love you to reconsider your love for Green & Black’s. While the product itself does get a green star from the Shop Ethical guide, it’s owner, Mondelez, gets a D rating. Companies such as Mondelez and Unilever do have certain products that are all glorious in their production and ethical standards, but for the most part, are geared toward extreme profit. By choosing not to support these large corporations, smaller, more ethical business have the opportunity to make the impact they were created for. Clicking on each section will give more detail. It is an interesting read. But there is hope! Alter Eco chocolate gets an A everywhere! Let’s support business who support the planet and support the people who grow and produce our food. The takeaway from all this? One little logo does not a fantastic company make. Do the research to find out where your money is really going, and who it is supporting. Use the Shop Ethical Guide. Use your skills to make a more informed choice. Hi there! I would love for me to consider my love for Green & Blacks too ;) I’ve began buying that brand back in the mid 1990s when it was independently owned, and very ethical. Of course, then they got bought out by Cadburys, who got bought out again by Kraft. I’m all too aware that there are more ethical options. Over the last few months I’ve been buying almost all of my chocolate from the bulk store, which is great for reducing packaging, but their chocolate is much higher in sugar. Considering how much chocolate I eat, I try to keep the sugar content down. I’ve been making my own, too. 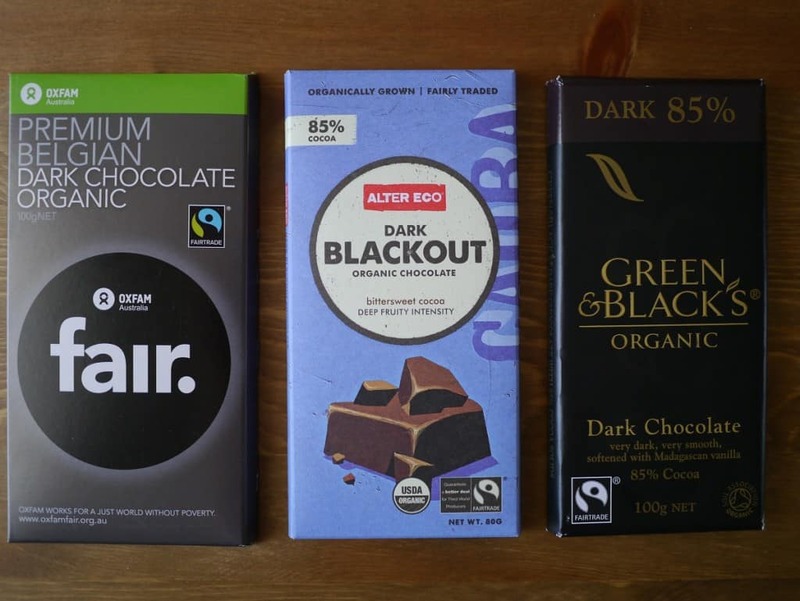 But the flavour of Green & Blacks 85% is still my favourite, and until I can find an alternative, the odd bar is likely to sneak in. It’s not on my regular grocery shop or anything (at least not any more!) but I still on occasion buy it. That’s why it is in this post of “exceptions”. I try very hard to make the most ethical choices that I can. I do read and research and try to keep informed. But I’m not perfect, either. Perfection is impossible for those of us who want to live ethically – I am tryping this on an iPad and using the NBN :). I regularly use fossil fuels for transport. 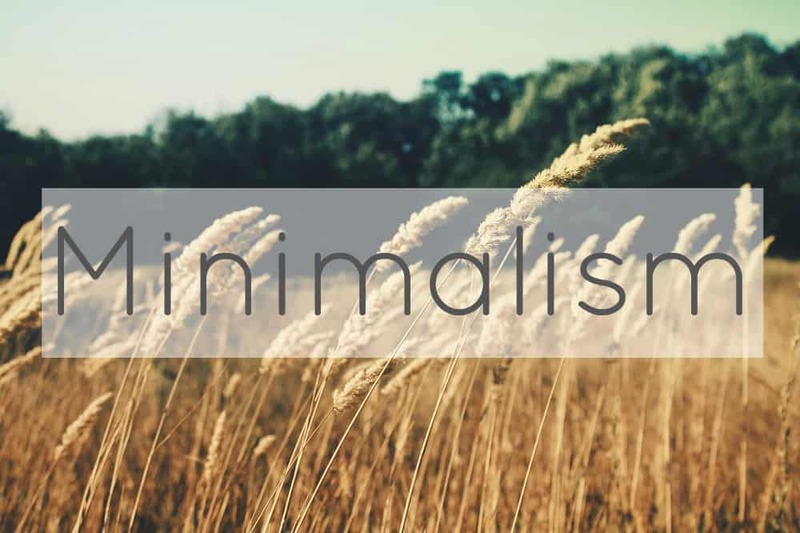 The list can be endless, and unless we are prepared to switch off technology and live entirely off grid, we will never reach a stage where we are living out a completely ethical life. We can rationalise anything, but it all comes down to our wants outweighing our desire to make the better choice. Good to have the debate! Some things are easy to quit, and others less so. But it is all a journey :) Thanks for getting in touch! Hi Lindsay, where do you get the olive pots?? Instead of those plastic seed containers, use toilet paper rolls! They’re perfect. My mom has used them for years. Just drop them in the ground, roll and all! Also, forget cotton buds. They can damage your ear. Get a metal cleaning scoop like they use in Asia.